Revlon Zealous and Heavenly, I said I was not going to purchase any more drugstore brands unless they were on sale. Well Walmart always has the lowest prices so I guess that would constitute a sale lol. 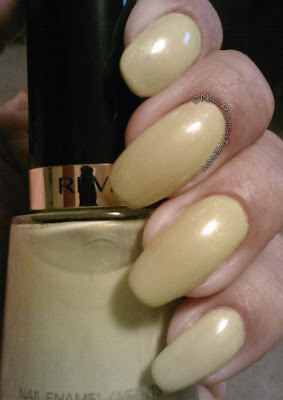 Here is Revlon Zealous with Heavenly. 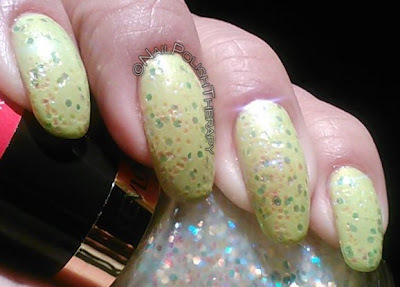 Zealous is a very light lime green barely yellow with rainbow shimmer. It's so bright but not obnoxiously so and I needed it with the recent gloomy weather. 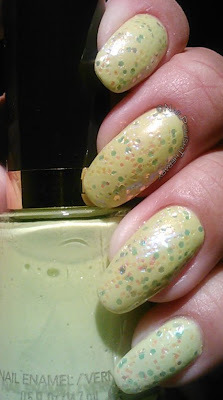 This is 3 coats because the formula was on the thin side. 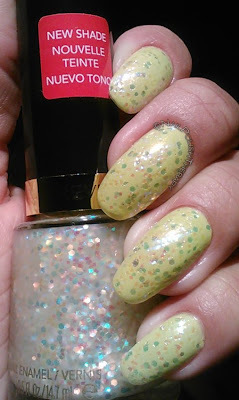 Heavenly is a clear base with glass rainbow dots (if that even makes sense lol). This color can go on just about anything and look great. The formula was consistent with Revlon and easy to apply.